Though some people have opted for permanent gold teeth, the majority are now purchasing removable gold caps. This style is also known as grillz, grills, fronts, packs, slugs, and gold teeth. These are becoming far more popular because when one wants to wear these for shows, events, or whatever reason they can clip them on. When they are done wearing them they can effortlessly be removed too. These must also be removed when consuming, sleeping and brushing. It is advised that these are for novelty purposes only and must be taken care of in that fashion. Gold teeth are manufactured in all karats of gold from 10K-24K. 10K gold is the least expensive and strongest against bending, but tarnishes easier than other higher karat options. 14K gold is the best value for a consumer on a budget. It has medium hardness, very bright shine and durable. 18K gold is more expensive, has a very bright luster, very durable and doesn't tarnish easy. 24K pure gold being the most costly but unmatched color and shine and doesn't tarnish. Although, it is very soft and bends out of shape very easily. You can choose any of these karats when you choose a grillz style. Gold is a precious metal that has a deep lustrous yellow color. When other metals are mixed in to make lower quality karats and gold colors; 10K, 14K, 18K, white gold, rose/pink gold for example, the metal is no longer pure. The lower the gold karat the faster the metal will tarnish when eating, and especially with smoking. Smoking is never encouraged by us but if you are a smoker we recommend a higher quality gold 18K-24K to avoid tarnishing or polishing regularly. A daily cleaning with a non-abrasive cleaner is recommended, then a warm water rinse. 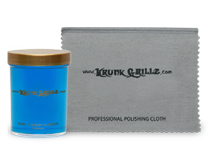 After patting dry, a soft cloth for polishing may be used to restore luster. With the proper care and maintenance your grill will last you a lifetime! Most gold teeth implants consist of two pieces: a titanium implant that is surgically screwed into the jawbone, and the actual gold tooth. The gold tooth is attached to the implant and functions just like a normal tooth would. With this application it can be used to chew and bite and cleaned like natural teeth and cannot be removed. In the last couple year's diamonds have been added into gold teeth by celebrities, professional athletes and rappers. These diamond grillz range from a single round stone in each tooth to being completely encrusted with White VS or SI diamonds. A unique array of colors and invisible settings are now being used for Gold Grillz. We create a custom experience for our diamond grillz customers so please contact us if you are interested in diamonds. In early periods of Egyptian and Chinese history, gold was used for false teeth because it was so malleable. In Fact, Skulls over 5,000 years old have been found with gold teeth are in their mouth.